What's Poppin' Tonight! 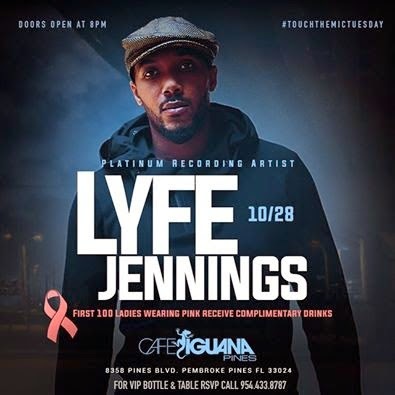 #TouchTheMicTuesdays presents LYFE JENNINGS Live Hosted by 99 Jamz at Cafe Iguana Pines ~ Phresh Hott New! Tonight! #TouchTheMicTuesdays featuring comedian Vanessa Fraction + For The First Time Ever Platinum Recording Artist "LYFE JENNINGS" LIVE Hosted by 99Jamz at Café Iguana Pines. And C.J. Hilton the New #BadBoy of R&B will be opening for Lyfe Jennings.